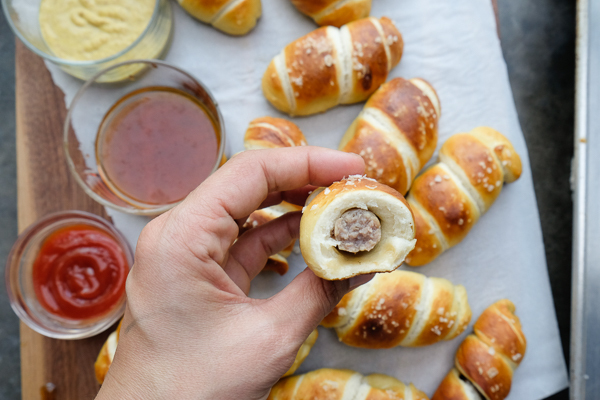 Breakfast Sausage Pretzel Rolls from Joy the Baker’s latest/greatest/AMAZING new cookbook, Over Easy. 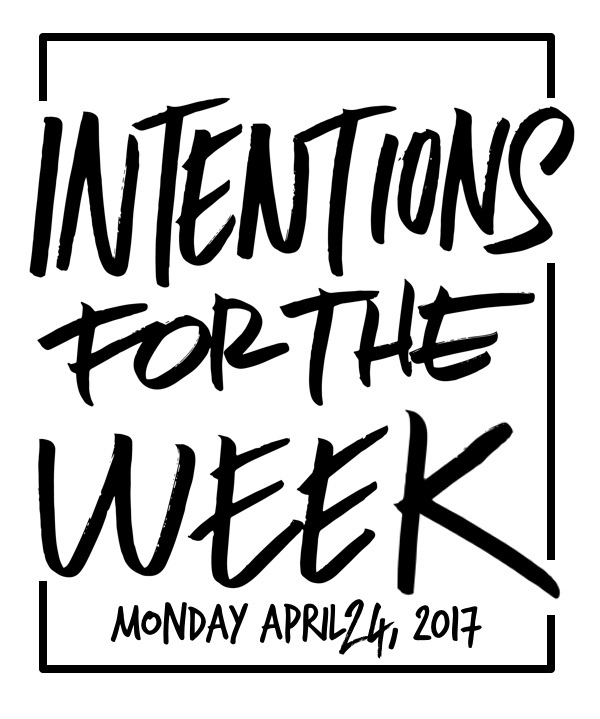 It comes out tomorrow and you’re going to looooove it. I already spilled butter on it. I already spilled butter on it. Hummina hummina hummina. We have a legit crowd pleaser. As in, we had none left. My parents (who were part of my pleased crowd) told me they preferred the breakfast sausage to the regular hot dog/pretzel dog situation. I agree, parents! 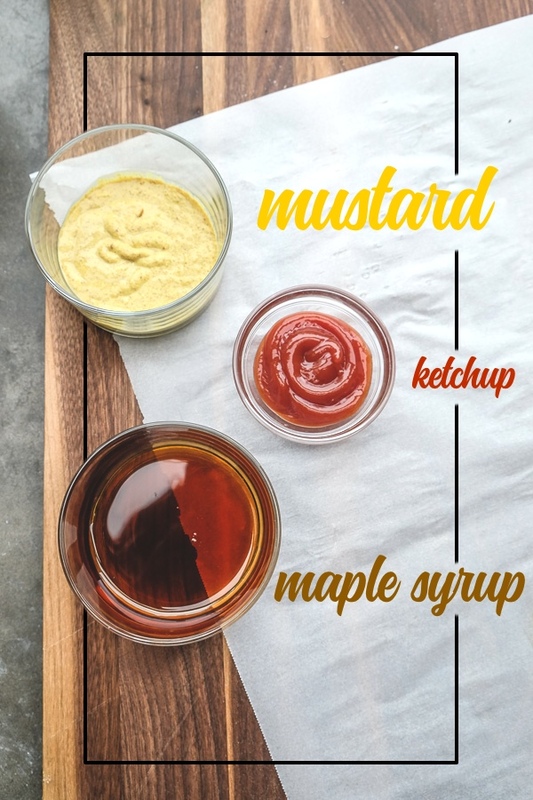 Maybe it’s gotta do with sweet/savory combo of dipping one in maple syrup! 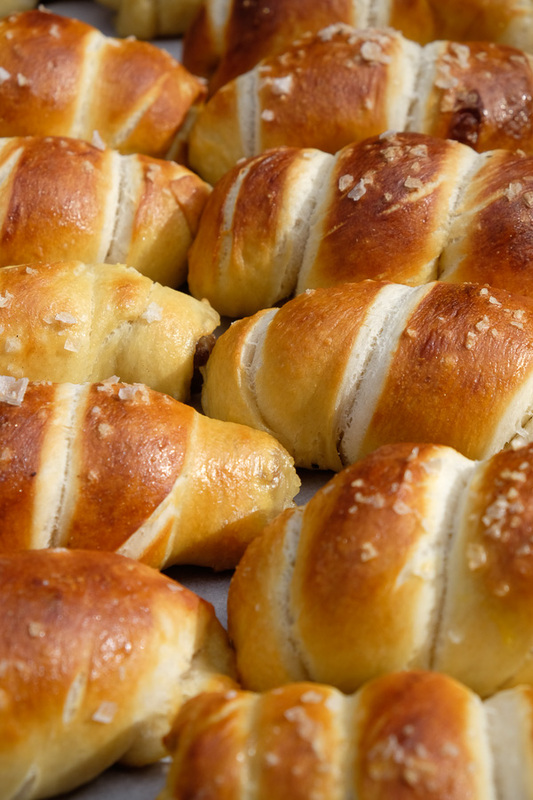 Pretzel dough is wrapped in sausage, then boiled, egg-washed, salted and baked. And then it’s dipped in your choice of maple syrup, ketchup or mustard. Heck, put some honey and hot sauce out while you’re at it! I forgot to put the egg in the ingredient shot. It’s in the egg wash at the end….so it’s fiiiiiiiiiiiiine, Tracy. It’s been awhile since I put my Kitchen Aid Mixer to use! So, here’s the thing. I am easily distracted. I also live with an 8-year-old who makes an unbelievable amount of noise. Sometimes when I’m measuring out flour, I lose count and then I panic. as I was going and then finished with the half cup of flour (I didn’t say half out loud). It worked! But then I started wondering if this is a gateway to me being a person who talks to herself? 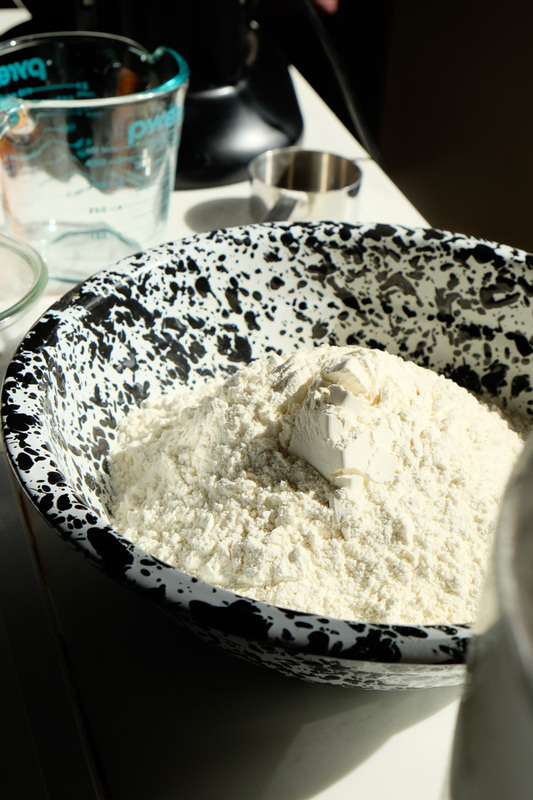 After the yeast gets frothy, we add the flour in with the salt and…. 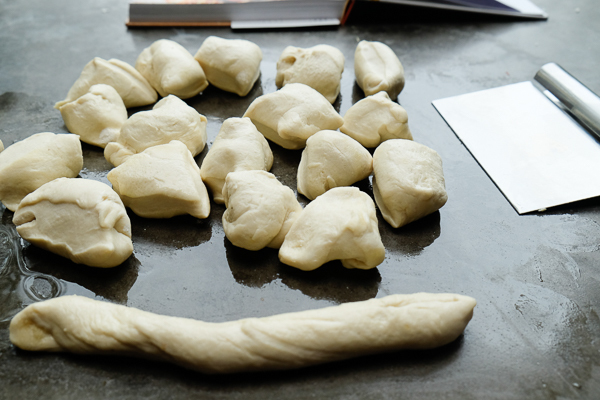 Man, that dough hook impresses the heck out of me. What a delightful dough. Maj knows the way to my heart…..BREAD. 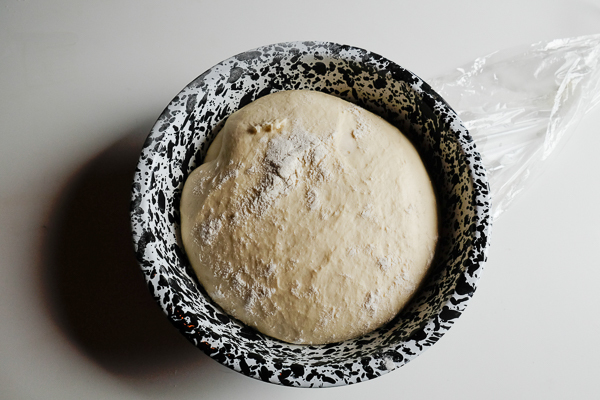 Dough gets to rest for about two hours. That means you have like 2 hours to cook yourself some breakfast sausage (and go back to bed) for this endeavor. When I cooked them, I made them sliiiiiiightly undercooked only because I didn’t want them to overcook after their visit in the oven. THEY WERE PERFECT in the final result. I don’t know if that had anything to do with it or breakfast sausage is just abnormally juicy. Did I just type that? 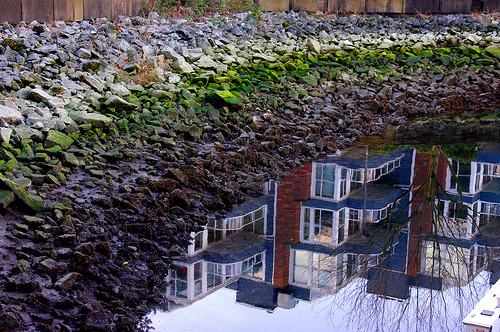 OCD dreams are made of this. 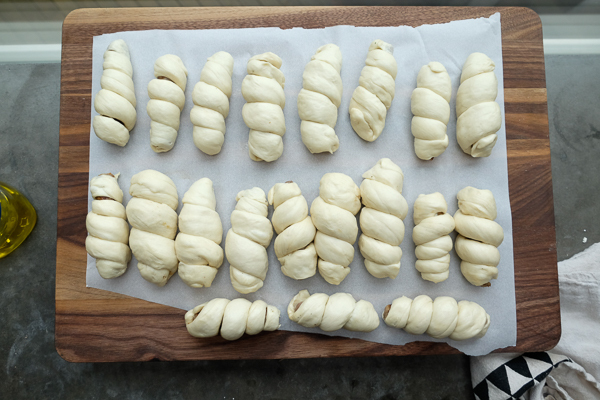 Except in my OCD dream, I did a better job making each and every piece of dough look exactly alike. That’s why it’s called a dream. Thank you to my husband for snapping this photo even though you don’t like taking photos. They look like unicorn horns to me. Or little mummies. Boil water! Pour in your baking soda. 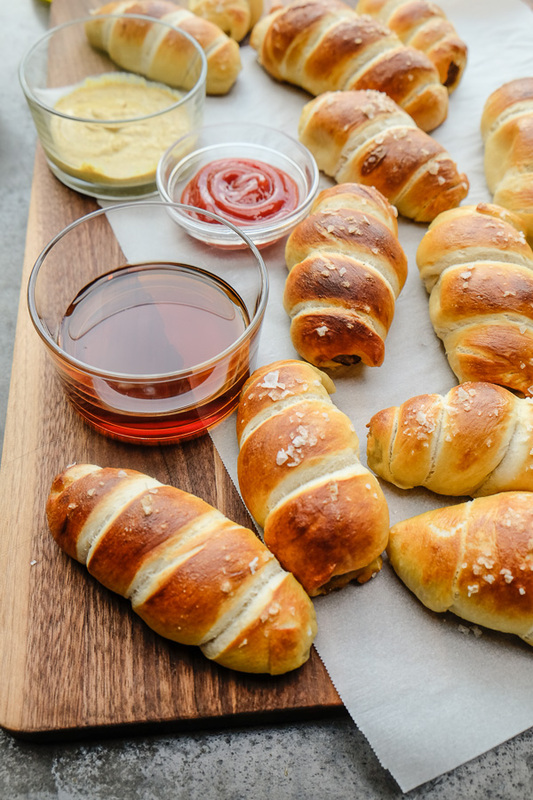 Drop the pretzel rolls in, about 4 at a time. 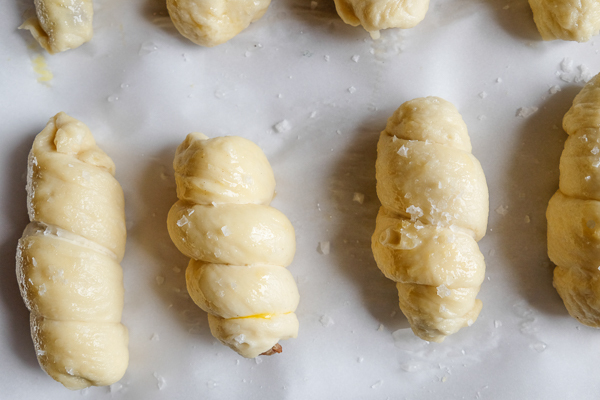 Cook for 30 seconds and then put on your prepared baking sheets. I want to have a ladies brunch/craft day where we feast from recipes from the book! 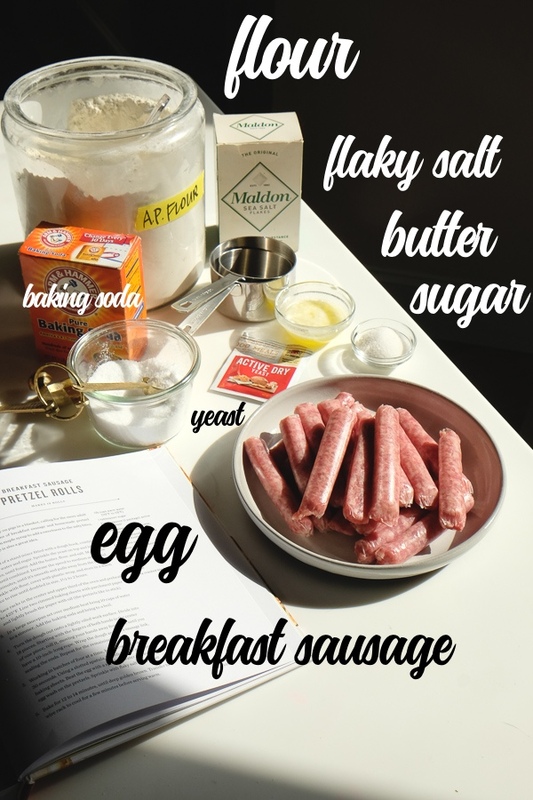 They’d also be great for a breakfast for dinner night. 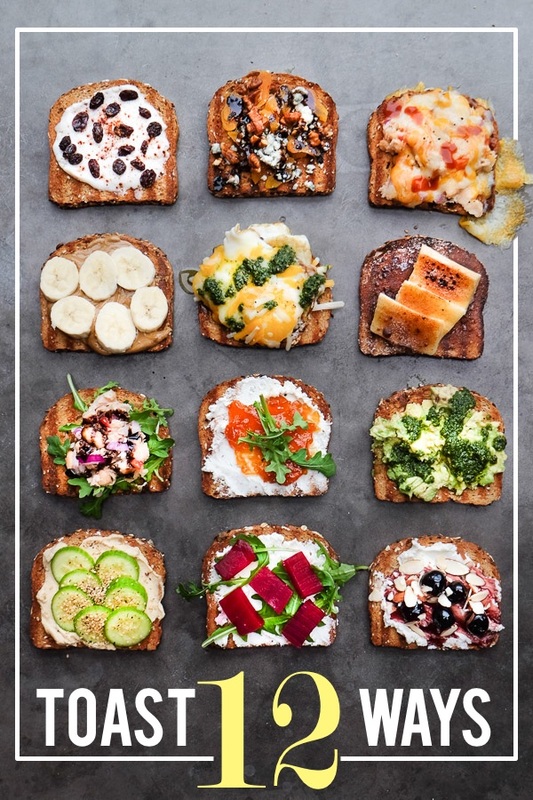 Be sure to check out Joy’s new book, the Over Easy: Sweet and Savory Recipes for Leisurely Days. 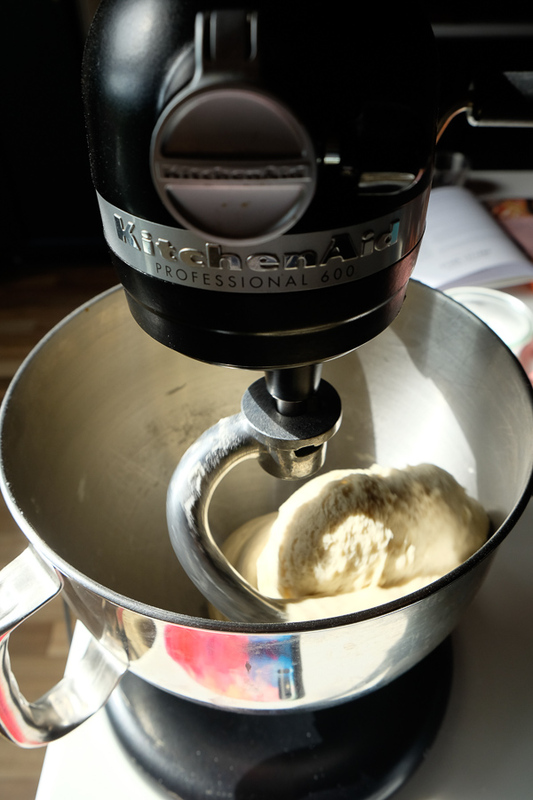 In the bowl of a stand mixer fitted with a dough hook, combine the warm water and sugar. 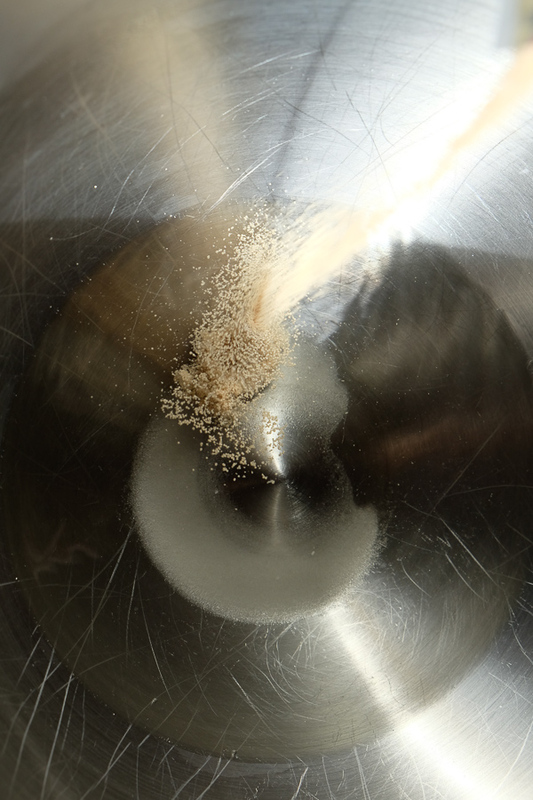 Sprinkle yeast on top and let sit for five minutes, until foamy. Add the butter, flour, and salt. Mix on low-speed until combined. 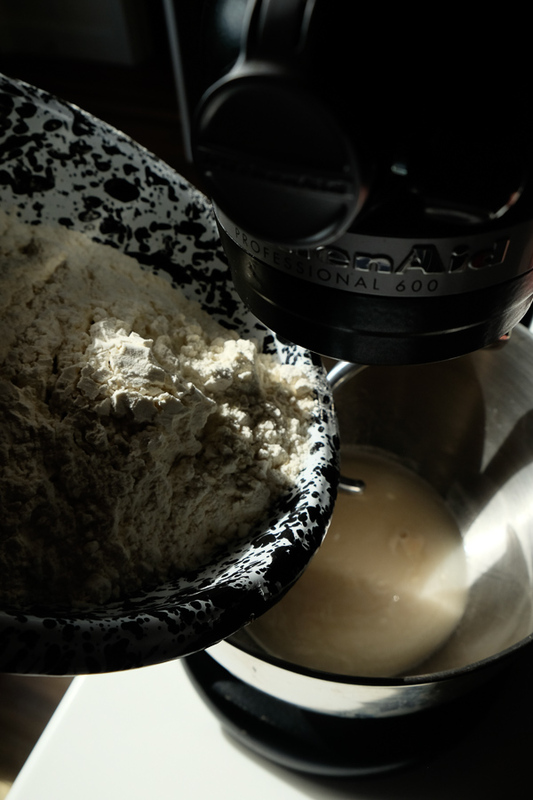 Increase this feed to medium and knead for 4 minutes, until it’s smooth and pulls away from the bowl. 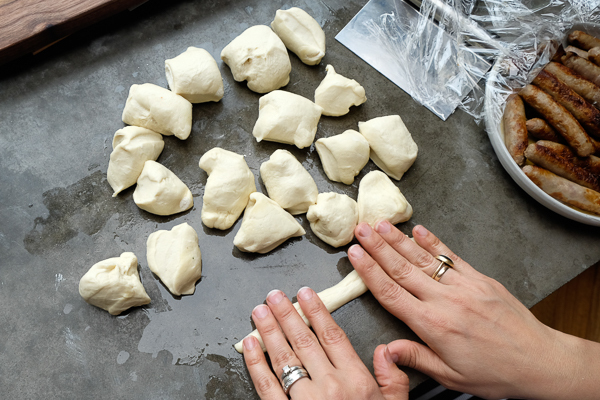 Sprinkle with flour, cover with plastic wrap, and store and a warm place to rise until doubled in size, 1 ½ to 2 hours. Place racks in the center and upper third of the oven and preheat to 425°F. 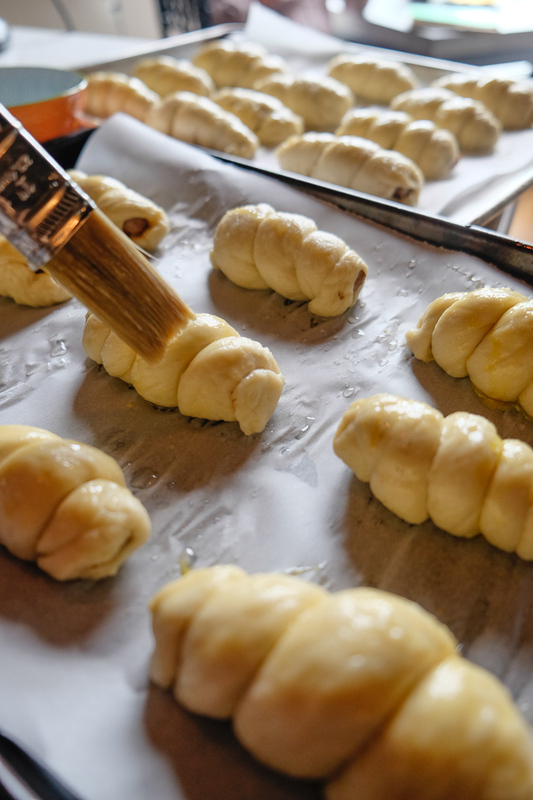 Line rimmed baking sheets with parchment paper and lightly brush the paper with oil (the pretzels like to stick). 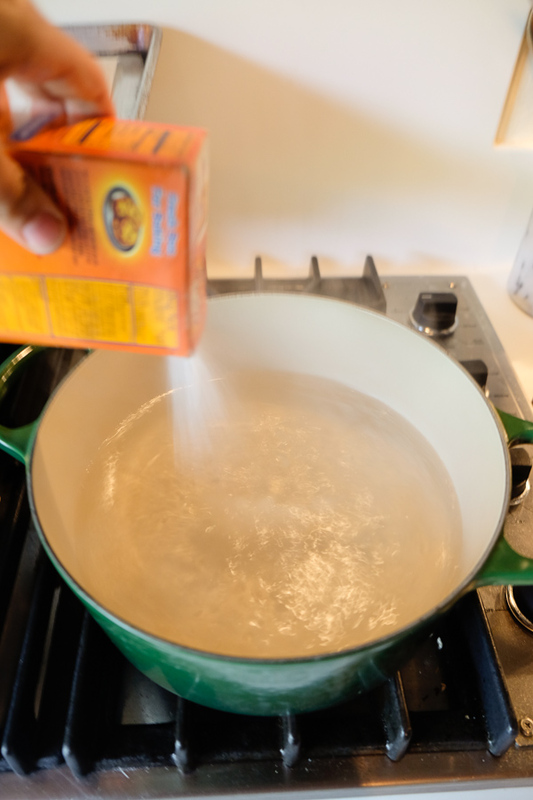 In a large saucepan set over medium heat bring 10 cups of water to a summer added baking soda and bring to a boil. Working in batches of four at a time, boil a few pretzels for 30 seconds. 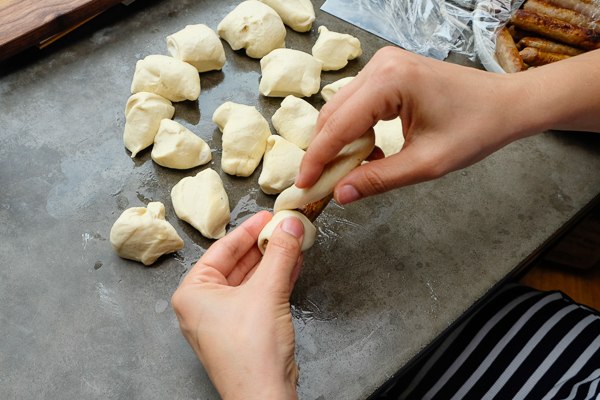 Using a slotted spatula, transfer to the prepared baking sheets. 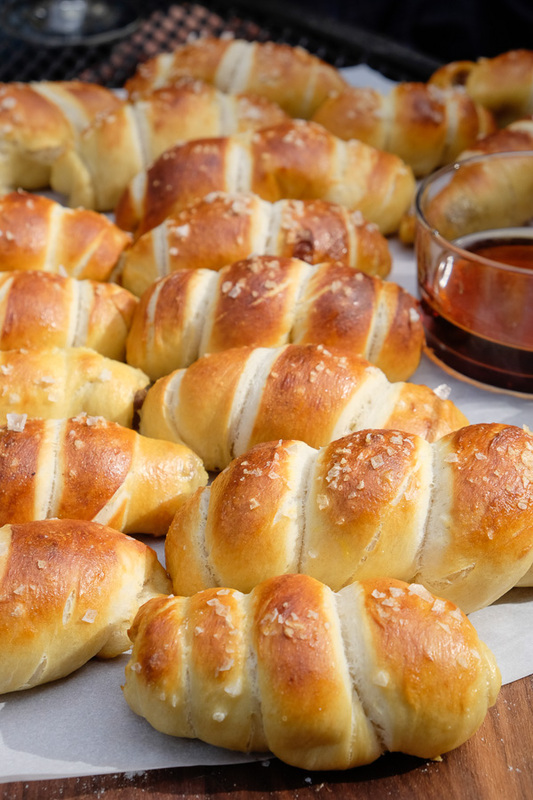 Beat the egg with a splash of water and brush the egg wash on the pretzels. Sprinkle with flaky salt. Bake for 12 to 14 minutes until deep golden brown. Transfer to a wire rack to cool for a few minutes before serving warm. Omg these look amazing. I’ve never made pretzel bread anything because the boiling then baking aspect intimidates me. I think I NEED to make these though. Thanks for sharing! same here, Rachel, but these look like da’ bomb. 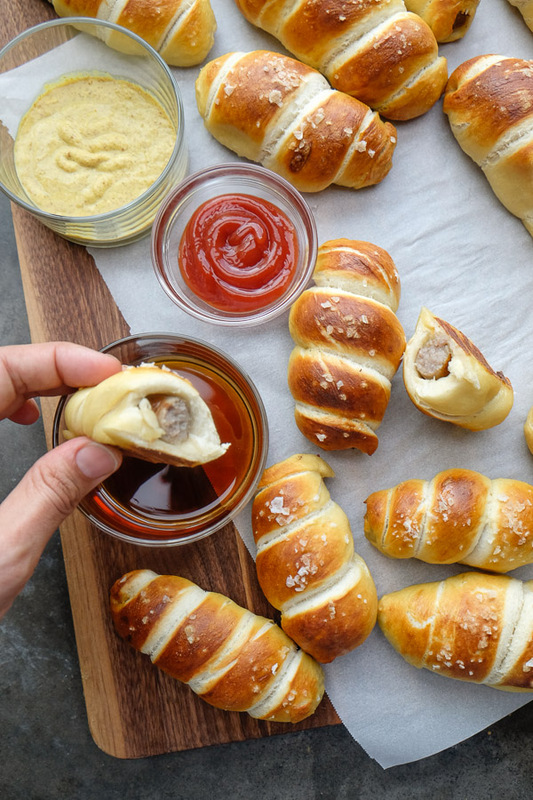 I can’t resist dough around sausages… and then the dipping sauce?! 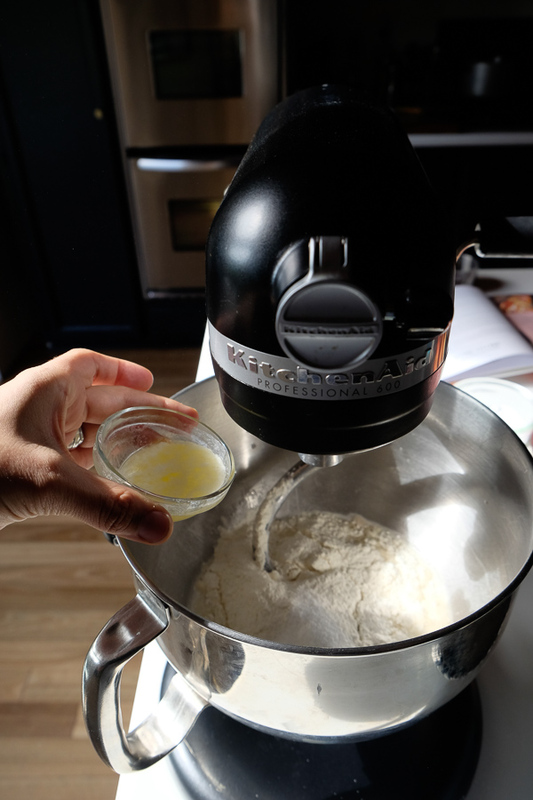 It’s really so easy and this dough is SOOOOOOOOOOOOO EASY with the mixer. It’s barely boiling too so that’s nice! you convinced me! Bought all the ingredients and am going to give it a go tonight! Oh my goodness these are making my mouth water, so yummy! These look so good. Thanks for the preview. My cookbook arrives tomorrow; per Amazon! 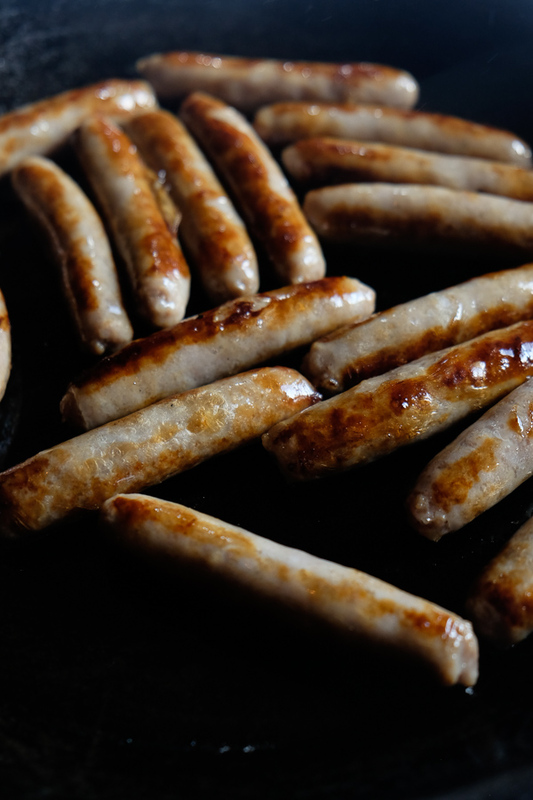 Vegetarian sausages? Morningstar makes some pretty decent ones. Yum! I just got my copy in the mail yesterday and I’m so excited to dive in! I’d love to give this a shot! Looks amazing. 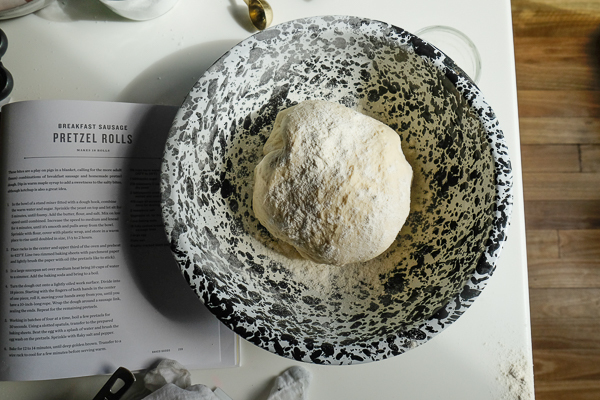 Did I read that right – the dough needs to knead in the mixer for 40 minutes? Nope. 4 minutes. I did voice to text for this recipe and I can see where the errors are now! I am sorry for the mix up! My fiance will looooove these. 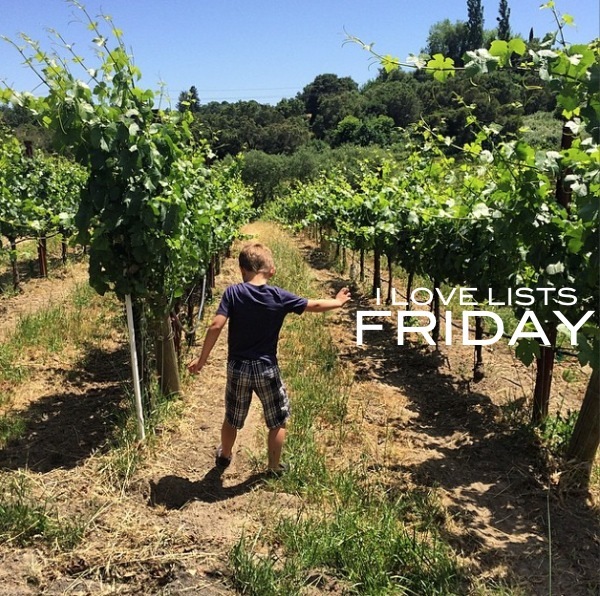 Might have to try them this weekend! For these ones, I used Johnsonville. They were great! 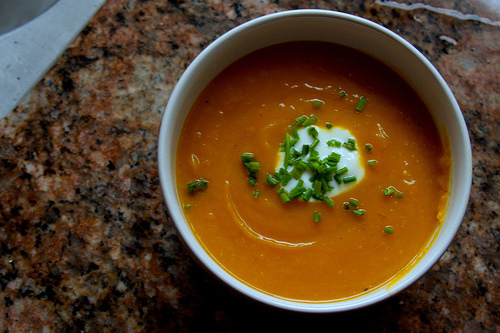 This recipe is good for me & for breakfast. 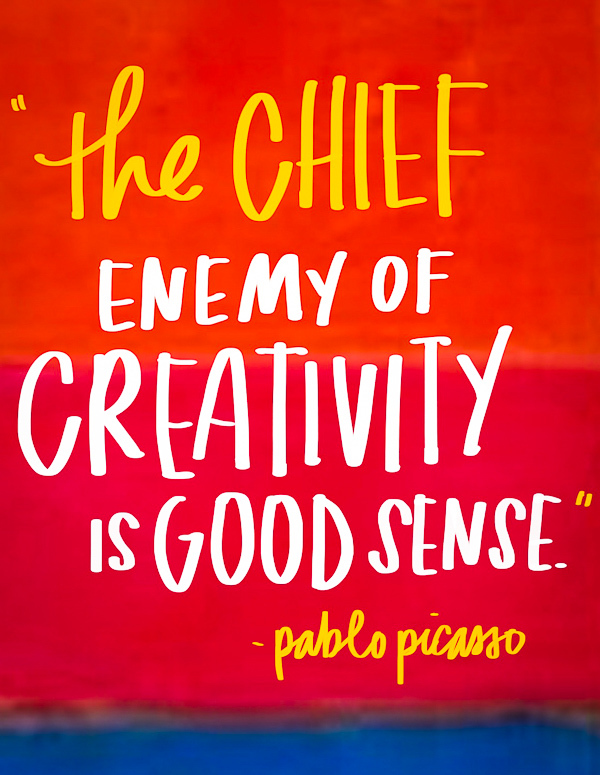 I love this and will try it. I’m trying to make these this morning, is it really 1 cup of baking soda? Oops never mind, should have read the whole recipe first. Sorry about that! Woah!! Made it last week, it was just delicious!! Evan a small thought of it makes me drool!! Will definitely be savoring this again in next few days!